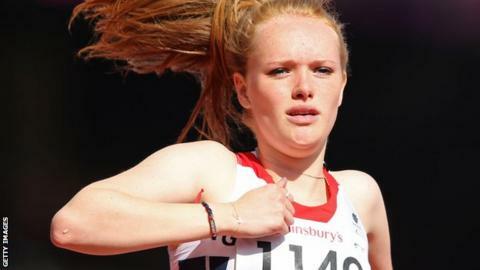 Northern Ireland sprinter Sally Brown finished sixth in the final of the T46 100m final at the Paralympics. The 17-year-old clocked 13.74 seconds in the Olympic Stadium on Wednesday night, well outside her season's best time of 13.40 seconds. Brown, from Ballykelly, regrouped well from the disappointment of failing to qualify for the 200m final and was thrilled to make the 100m final. Cuba's Yunidis Castillo won the final in a time of 12.01 seconds. Brown was troubled by injury this season after winning a surprise World Championship 200m bronze in January 2011 and has struggled to get near her personal best time of 13.15 seconds in the 100m. All three medal winners ran under 13 seconds in Wednesday night's final for single arm amputees. Castillo completed the sprint double, adding the 100m to the 200m title she won last week. Russia's Nikol Rodomakina claimed the silver medal with China's Yanping Wang winning bronze.